Mixxx prompts the user to define a music location upon its first launch and puts everything on the library. 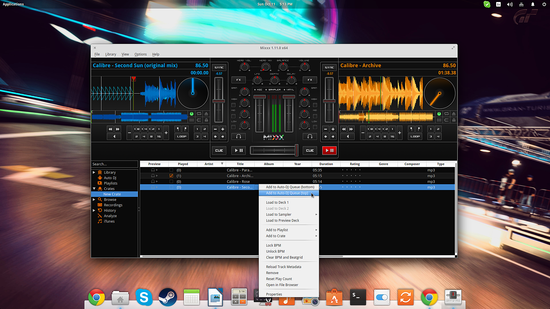 From there you can drag and drop songs to one of the two decks located on the left and right sides. On the center you can find the two volume sliders for each channel and a handy crossfader just underneath them. 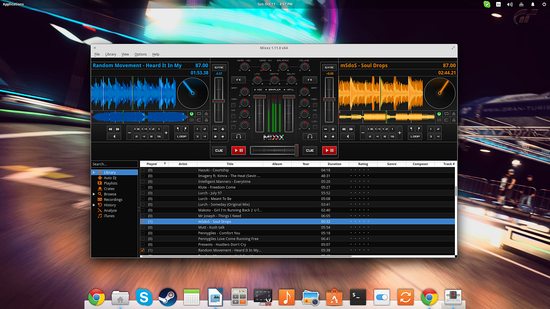 One of the most important parts of Djing is the synching of tracks and Mixxx offers good features on that part. By pressing the headphones icon that is located just above the play/pause icon of each channel, audio is sent to the corresponding output allowing you to listen and sync the upcoming track. You can also press the “sync” button that is positioned next to each track's waveform to let Mixxx auto-adjust the sync of the upcoming track. This works in most cases, but not always right. Right-clicking items from your library will open up a set of options like the addition of songs to DJ session virtual crates. This helps you select the tracks you want to use in your live session. You can also right-click the songs in your crate or in the library to send them to the “Auto DJ”. Hop on the corresponding tab, set a fading timer, press the “Enable Auto DJ” button on the right, and Mixxx will take care of the rest (syncing and proper crossfading). If you want to add some specialty in your performance, you should know that you can grab the spinning vinyl right next to the waveform and do some scratching on the playing track. Grabbing it with the right-click will let you scratch in time while the song playback continues in the background. The exact same thing can be done by grabbing the waveform and dragging it left and right, while right click here will slow or speed up the tempo. There is also an effect channel that you can enable to set the basic characteristics of the sound (gain, high, mid, low). For more goodies, visit “Preferences” and you'll find quite a lot. Mixxx developers are on the verge of releasing the next major version of this magnificent piece of software that is going to feature among others: 4 decks, new effects (flanger, reverb, echo), new user interface skins, cover art, vinyl audio pass-through, music key auto-detection, and better waveforms. The best part is that you can already give beta version a spin. If Mixxx isn't working for you, you can give TerminatorX a try which is another open source DJ and mixing software tool with a different GUI approach. It supports multiple channels and has on-the-fly mixing abilities. The only commercial tool of the kind available for Linux right now is the Ultramixer which you can download and try for free, with the only limitation being the 60-minute sessions.